My daughter owns 2 different model pii's so that might not be a bad idea Ad7 , I will see if she fancies it. Your CoD collection looks really smart, Gemini - it's great to see a line-up like that. Nice going! It does look neat when you have a series together. I kind of wish I'd picked up some of the collector editions along the way, but hey-ho. That's a good shout. I wonder how long online play will be available for on the PS3 and 360 systems? I've no idea. Considering it's been 13 years so far and is still going strong a ' switch off' may very well be a little while off yet, if at all. I grabbed Time Splitters 2 For xbox complete for 50pence and Medal of Honor frontline (platinum) for gamecube complete for 50pence today from a charity shop. 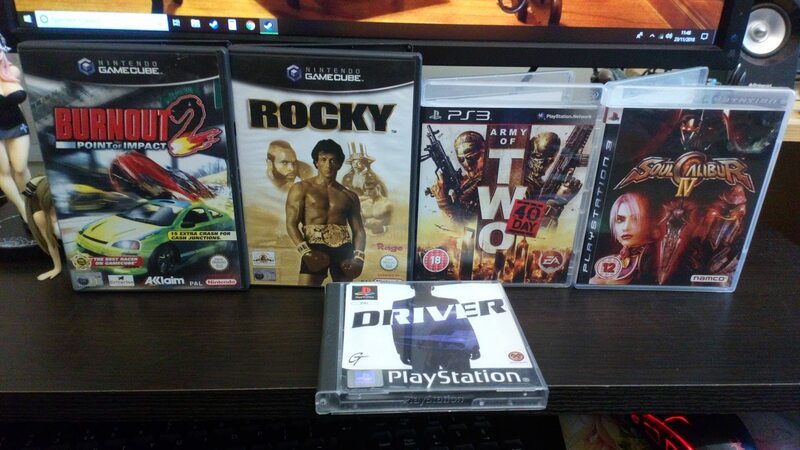 I wish our charity shops had some games. I keep checking every time I'm in town, but still no luck. Gemini73 wrote: I wish our charity shops had some games. I keep checking every time I'm in town, but still no luck. All I find are knackered copies of Fifa 13 for PS3 and Wii Music, no Kerr's mystery goldmine. There was a lot more games in this one than I grabbed but most of the others fell into one of either 2 categories and that's basically fifa games and the other is stuff that's so scratched its just not worth bothering with. The worst is when you see a decent game youd like a bit but then look at the disc and realize its either so beat up it will need a resurface and then unless its mighty rare its not worth it or just so ruined its not repairable....oh or where people have nicked the disc. The worst shop I visit is a particular branch of Sue Ryder who think every single game including beat up old copies of fifa 2014 is worth £3.99 I havent got much from there at all except when they decide they have too much stock and start marking things down... they litterally mark things down from £3.99 to either 50p or 25p with no steps in the middle, its a bit of a weird shop, they currently have a lot of Imagine and crossword puzzle type DS games in and xbox 360 Fifa. I probably do OK because I go to my local ones, my fiancee's local ones, and then the ones near my work. Works basically just between us, so I also sometimes check the ones near work if I am heading to hers or on the way back from hers. A bit late to the party this weekend but here's a little GameCube selection. I'll follow it up at the weekend with some more GameCube. 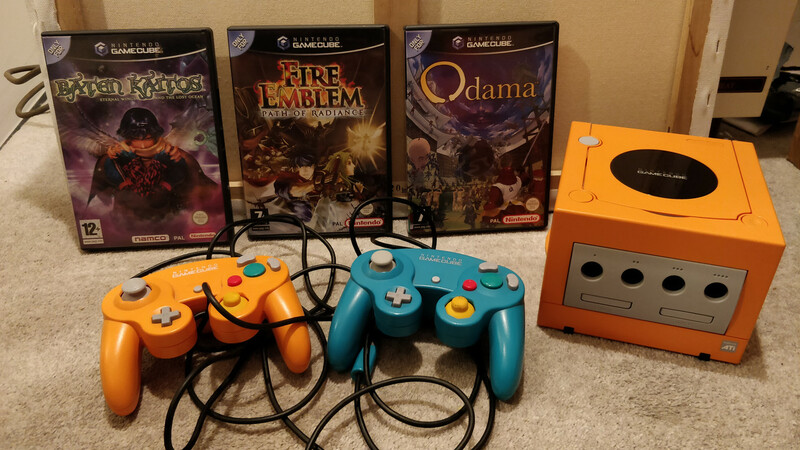 This week we've got my favourite GameCube colour (apart from the dev console Teal), a controller that I wish had a matching console and a few games. One is the voice controlled pinball Shogun war game - Odama. It's not too expensive to pick up and came out towards the end of the life of the GameCube. There's also Card Battling JRPG Baten Kaitos, it's like an ever so slightly less camp and more serious Yu-Gi-Oh. There was a follow up game but it never came out in PAL territories. The final game is everyone's favourite over priced tacticle role-playing game staring that one with the sword from Smash Bros - Fire Emblem: Pretentious subtitle here. That looks great, Sandy... so spicy! I recall reading about Odama and I liked the idea of it; battling in pinball using your voice sounded like ridiculously quirky fun! Sandy wrote: A bit late to the party this weekend but here's a little GameCube selection. I'll follow it up at the weekend with some more GameCube. Oh wow, that Cube and controllers look awesome. Just what is wrong with Fire Emblem people. Nobody cared about FE before Awakening came out. I barely even knew what it was. Path of Radiance will probably be the title I never get for GC along with maybe Skies of Arcadia, unless I happen to get lucky in a charity shop or something. My girlfriend really wants skies of Arcadia but I often can't choose between dreamcast and GameCube when I consider it. Can anyone recall the differences? I think the Gamecube Skies had extra stuff in it. I originally paid £19.99 for Fire Emblem for the cube second hand in GameStation back during the machines heyday, an ex friend stole it (and about 4 other games) and I had to buy it again, after lots of searching I managed to get a copy for about £40, this was just before copies started to really really climb. It is probably my fave cube game but losing the original copy is the reason I stopped lending games to friends. When friends have asked me if they could lend x y or z since I have said no, if the game they've asked to borrow has been cheap like under £5 I have from time to time just purchased them a copy but I wont let anyone have any of my games.... I guess that sounds a bit petty. Its a real shame as I used to be very open and like hey whats mine is yours take home whatever you want and play it and the above incident combined with something that happened to me as a kid (the son of a family friend stole a biscuit tin I had with 40 megadrive carts in it and basically sold them for drug money) really really changed my attitude on my own possessions. Fire Emblem prices are crazy now, I must have passed on the Gamecube version so many times at reasonable prices and have resigned myself to never owning it now because the prices are just ludicrous. I briefly owned Radiant Dawn on Wii, picked it up for about £5 when Game were having that closing down sale a number of years ago, stupidly sold it on for about £30 as I didn't really get into it. Was pretty happy with the profit I made but in retrospect I wish I'd kept it. It's not reached Path of Radiance levels, seems to regularly go for £40-50 on eBay so I could pick it up again but it's annoying! My Radiant Dawn was £35 from Tesco on day of release.. The real star of the three for me is the GBA Fire Emblem as I got that from a carboot for £5 complete, I had no idea what it was when I got it, I literally spent the cash thinking oh well if its crap I can always trade it in im bound to get more than £5 for a complete GBA game (it was while the machine was current) and as soon as I started playing it I loved it, although at the time I did kind of think it was a Vandal Hearts/ Final Fantasy Tactics rip off as Id played both of those on the PS1 which seems very funny now. Working this weekend so I'll post my latest purchases. 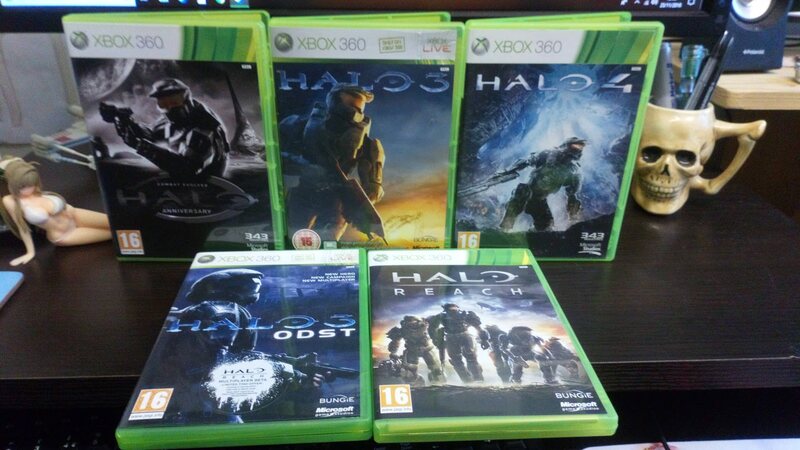 Also picked up the Halo titles. Am a bit annoyed that I didn't check the discs though as Halo 3 came with the Classic disc, not the original. Still, it works fine and was only £1.50. Not worth the hassle of heading back into town to change it. On the plus side the copy of ODST came with an unused 48 hour XBLG code. Another cracking set, Gemini - you're getting plenty of gaming bang for your buck! Burnout 2 is such a classic (Crash Zones ) and you get bonus kudos for including an X-wing tucked away behind Halo Anniversary! Cheers, dude. The X-Wing is one of those snap together kits. My children bought it for me a couple of Christmases ago.